I am happy to welcome you to the April Magnolia-licious Chrismas All Year Long blog hop; Hope you had a lovely Easter day, and ate lotssssss of chocolate. I did... If you come from Corinne's blog, you are on the right track, if not you can start at the beginning by clicking HERE. But before I show my card, I wanted to share with you, pure beauty! 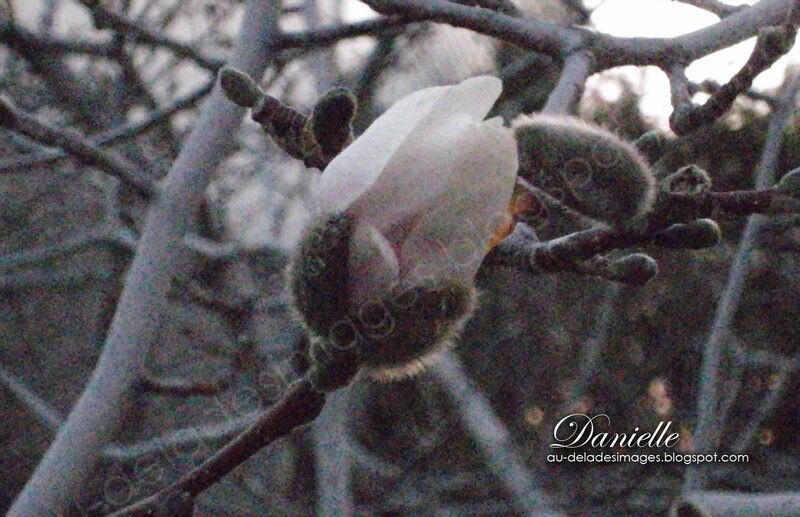 We had terrible weather lately, one day of full sun makes miracle, this picture is a MAGNOLIA BLOOM... admire. Je vous accueille ce matin dans le cadre de la tournée des blogues de Magnolia-licious Christmas All Year LOng. J'espère que vous avez eu une belle journée de Pâques et que vous avez mangé beaucoup de chocolat! Si vous arrivez de chez Corinne, vous êtes sur la bonne voie, sinon, vous pouvez commencer du début en vous rendant ICI . Ci-haut, voilà ce qu'une journée de soleil crée comme miracle, c'est un bourgeon de MAGNOLIA qui s'ouvre. On to my card now, I started by choosing the wonderful sketch of Just Magnolia. It offered me the possibility of exploring a crocheted doily border as seen in the Valentine issue of Magnolia ink; however, I had seen Jeanet''s tutorial on a double border version, as we do in flowers, and I felt it was a nice challenge. I chose Waiting Tilda and the sled from the 2008 Magnolia Winter collection for this card, both were colored with copics, as well as the winter forest, both in large and mini version. 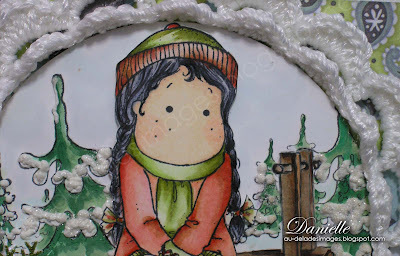 On the trees, I used liquid applique and lotsssss of stickes, (diamond & frosted lace). My paper is from Snow day earthtones, from American Traditional Design, all my cartstocks are from SU, and the glittery cardstock is from Best creations. J'ai choisi de travailler avec le sketch de Just Magnolia. Il m'offrait la possibilité d'explorer un double tour au crochet autour de mon image tel que vu chez Jeanet's. C'était un défi à relever. J'ai choisi Waiting Tilda et le traineau e la collection Malgnolia Winter 2008, que j'ai colorié avec des copics, tout comme Winter forest, en version mini et régulière. J'ai aussi utilisé du Liquid Applique et beaucoup de stickles (diamond & frosted lace). Les papiers sont de la collection Snow day earthtones de American Traditional Design, mes cartons de SU et le carton brillant de Best Creations. Thank you for stopping by, and telling me what you think about my card, please continue your way to the very talented GLENDA to admire her wondeful creation. Have a lovely day! Merci d'être venu me visiter, et de me laisser un mot, vous êtes maintenant en route pour le blogue de GLENDA, je suis certaine qu'elle vous a préparé une super création. Passez une belle journée. PS: I though I'd show you a bit of the beauty of where I live. 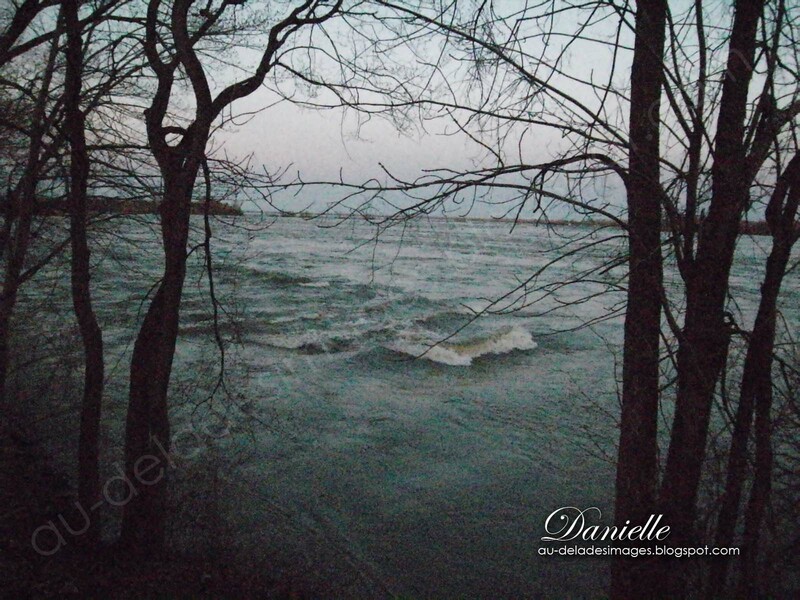 At the end of my street, the St-Laurence river runs majestically. I take my walk along the path every day. Last night, the sun was setting down and the colors were just magnificient. J'aimerais partager avec vous un peu de la beauté du paysage, juste au coin de la rue chez moi. Le Saint-Laurent coule majestueusement, je demeure environ à 5 minutes des Rapides de Lachines. La petite vague ci-dessous, est prisée amateurs de planche. I love your card too...pretty Tilda, and the crocheted doily is wonderful.Great backgorund also..love the snow on the trees. Your card is beautiful, love the crocheted doily border and the ribbon adds the finished touch. Le tour au crochet blanc est une très belle idée....on se concentre vraiment sur l'univers de Tilda. Une carte, encore une fois, très très bien réussie! J'espère que tu as eu une belle journée de Pâques et beaucoup de chocolat!! Wow, I am loving this crocheted doily....absolutely gorgeous!!!!!! Beautiful photos Danielle, thanks for sharing. Your card is adorable. Love the crocheting around the outer edge. What an amazing place to take a walk everyday!!! Beautiful! Love your Tilda on the sled Danielle! 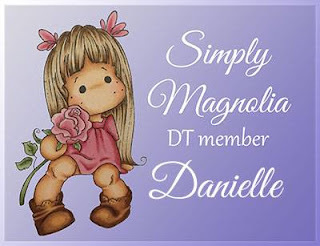 Danielle, this is gorgeous! Love your crocheted border! Great job! Very-very pretty! Love her soft black hair and muted tones on her clothes...so lovely. Plus that crochet frame is just TOO cute. Thanks for playing with us at MIC this week - and we sure hope to see you back again and again and again! Wow...what a great view you have on your walks! 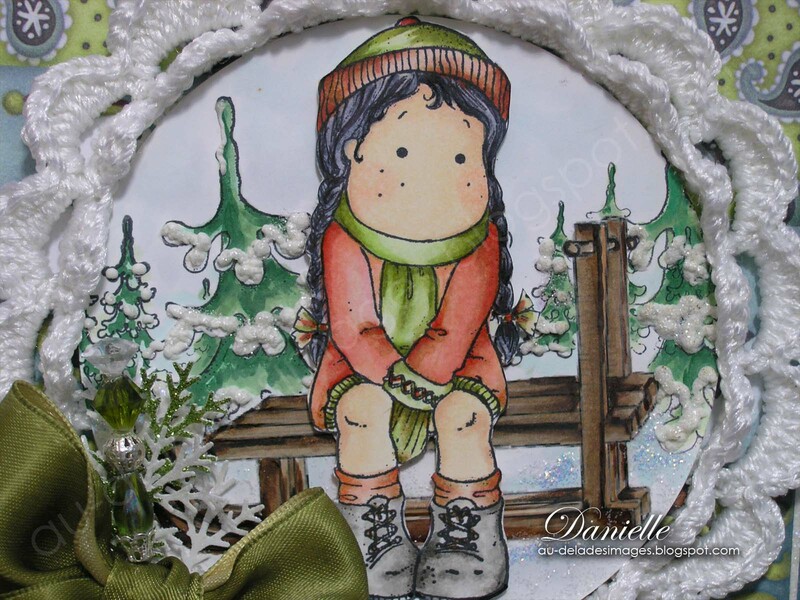 And what a gorgeous card...it looks like she's sitting in snow! Beautiful! Ta carte est magnifique! les couleurs sont superbes! 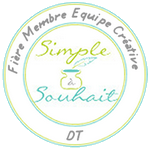 et ton tour au crochet est superbe et donne un superbe effet a ta carte! WOW...beautiful card!!! The crochet is such a neat touch to the card. Love it! Beautiful card! love the crochet! Awesome card, I love the crocheted frame. Also, that blossom looks downright cold. Thanks for sharing pix of your incredible part of the country! The doily is very effective. wish I could crochet. the scene you ahve created is fab. Pretty card. Love the crocheted edging. Wow! 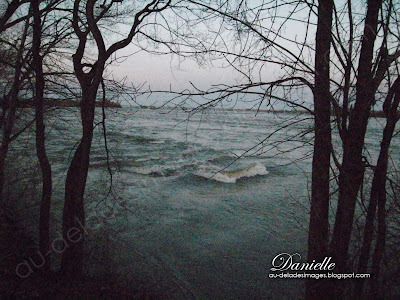 What beautiful scenery you have right in your neighborhood, Danielle!! You're a lucky lady! Your card is gorgeous! Love the crocheted border around the frame! And your coloring is spectacular! I love everything about it! I love this card! The crochet around the edge is fantastic. Can't wait to learn how to do this. Thank you for joining the blog hop this month! Ahhh your card is stunning as well! I love your colouring of course, along with that crochet doily and that big lush green bow adds the perfect touch! GORGEOUS!!! Hi Danielle! 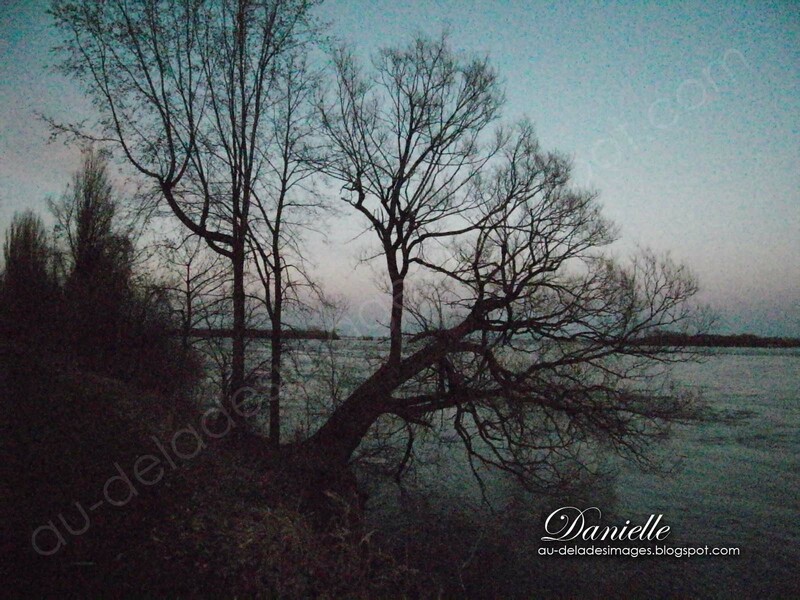 The photos are gorgeous, you are so lucky to have such beautiful places in your neighbourhood. I love your beautiful Christmas card. You have created a delightful winter scene and your coloring is simply fabulous! I love looking at your card; that crocheted doily looks amazing and gives dimension and a sweet nostalgic feeling to your card.Love it! Your cards are truly done with so much thought.They always bring a smile to my face. Your sceneries are sooooo adorable and precious teheeee! Oh those pictures are breathtaking hun!!!! What a view to be close to hey! Gorgeous crochet frame on this card and beautiful design Danielle. Your Christmas card is beautiful, Danielle. Love how you crocheted two rows on the doily! Goodness, you live in a beautiful area and to be able to see a scene as those in your lovely pics is like a dream! I wish I could actually be there to see this aren near sunset! Thank you for sharing your card and the lovely pics! This is a Fabulous Card! So much work and detail with beautiful coloring. Great crocheting too! And.... your pictures are marvelous. What beauty!! 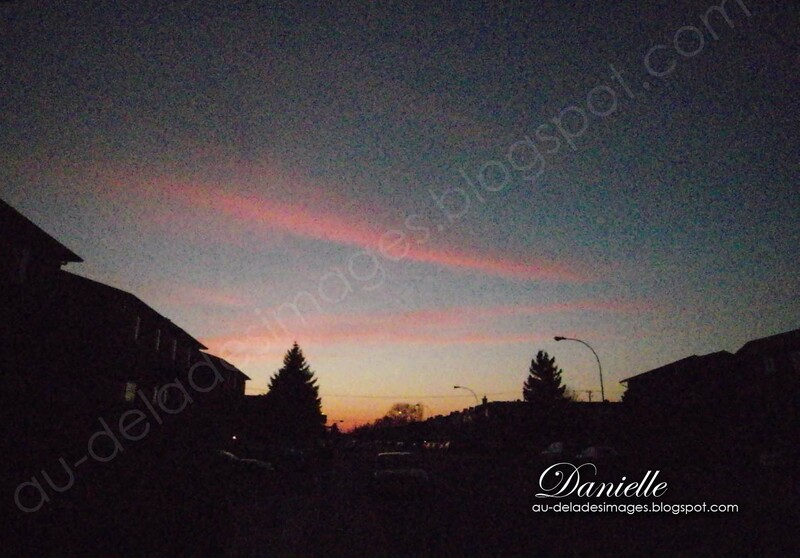 How beautiful, Danielle! Your pictures are breathtaking. I love your Christmas card! The crocheted border is beautiful. I'm going to try one. Your coloring is great. Just such a pretty card. Beautiful job on the crocheted border!! Lovely coloring as always!! Danielle, you've outdone yourself again! The crocheted border is so pretty. Your coloring is amazing, the big bow is the perfect touch. Gorgeous scenery pics as well. Your card is so beautiful. What a lovely combination of stamps and that doily is so pretty. Isn't the weather crazy? I love the picture of your magnolia bloom. I am waiting for the buds on my tree to open up! Modit que t'â du talent! Coudons y'a tu quekchose que tu sais pas faire avec tes $%?&*/" de mains. Fini les folies, j'ai juste une chose à dire: magnifique. wow what a beautiful place to live lucky you. Your card is so sweet love the crochet circle. Thanks for joining us at MIC. what a beautiful view you have! that would certainly inspire me to create! i adore your card and your coloring - her hair looks fab. thanks for joining us at make it colourful this week! Absolutely lovely card !! I like the scene and the doilies are great ! Wow utilisé le crochet dans une carte. On n'a l'impression que sa nous réchauffe malgré la neige. C'est vraiment un ajout qui apporte beaucoup. Ça fait changement et ça donne une texture différente. J'aime beaucoup.